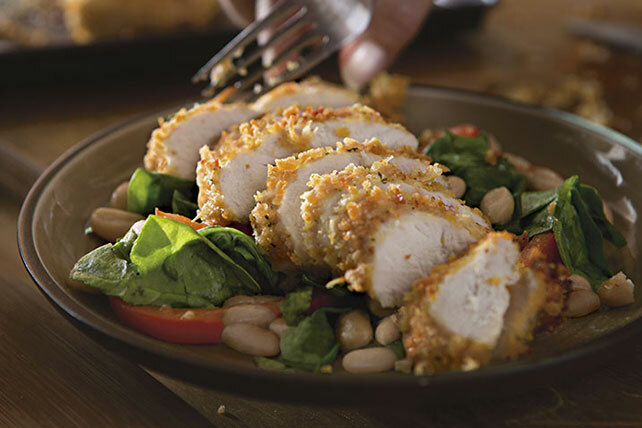 Chicken breasts are coated with a zesty Parmesan breadcrumb mix and served on a salad of baby spinach leaves in this tasty, sensible dish. Spray baking sheet with cooking spray. Combine bread crumbs and cheeses. Moisten chicken; lightly press cheese mixture onto both sides of chicken to partially coat. Place on baking sheet; sprinkle with remaining cheese mixture. Bake 28 to 30 min. or until chicken is done (165°F). Heat dressing in large skillet on medium-high heat. Add peppers; cook and stir 3 to 4 min. or until crisp-tender. Add beans and spinach; cook 3 min. or just until spinach is wilted, stirring constantly. Serve chicken over spinach salad. We really love this recipe which was originally developed using our recently discontinued FRESH TAKE Cheese Bread Crumb Mix. We revised it to use panko bread crumbs and KRAFT Grated Seasoned and Shredded Parmesan Cheeses. Give it a try! Cannellini beans are white Italian kidney beans that are available both in dried and canned forms. They make a wonderful addition to soups and salads. If cannellini beans are not available, use navy beans, great Northern beans or kidney beans instead.